My relationship with Kuntz Memorial Lutheran Church in Omaha is significant to my story. After my parents passed away, my grandparents were unable to care for my sister and me. The pastor of their church suggested they bring us to Tabitha Orphanage in Lincoln, Nebraska. The orphanage was a great place to live, and the Lutherans there tithed to the orphanage, giving us all wonderful loving help. Kuntz Memorial Lutheran Church also provided special things to the orphanage. Among their gifts: a new dress at Easter and stockings filled with small goodies at Christmas. The love of my grandmother and the people at Kuntz Memorial Lutheran Church showing me God’s love made a huge impression on me. My gifts are working with people and helping others — especially children and the elderly, who have little in the way of financial resources. Mary Kunz, another woman, and I started a group called the SewNSews many years ago. 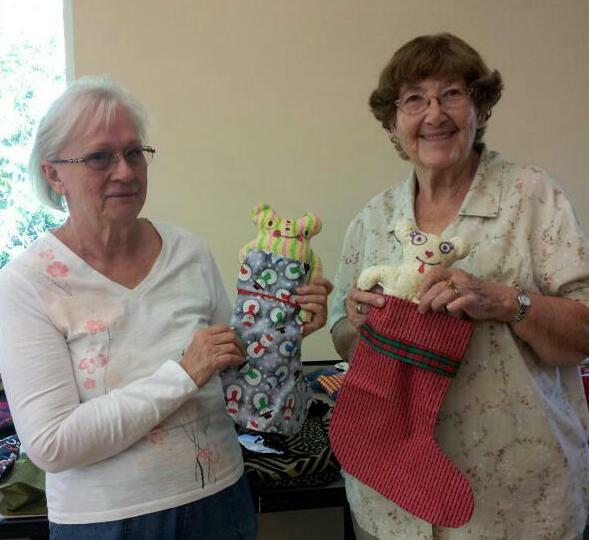 Our group connects to create sewn items for neglected and abused children or senior citizens living alone or in nursing homes who might otherwise not receive Christmas gifts. We meet at the front porch of the Golden Recreation Center each month to plan and discuss our projects. Then from home we make a variety of items, including totes for seniors, Christmas stockings, hand-tied quilts, and small stuffed toys for children. I personally don’t work on quilts because when I was in the orphanage, I was often naughty and sent to bed early. Now, what’s a little girl going to do in bed when it’s still light outside? I spent my time untying all the knots in the hand-tied quilts on my bed! I was quite good at it too! Of course, when they discovered all the little ties under my pillow on my bed, I was sent to bed early again. Even so, I love that I am able to “pay it forward” for all the loving gifts given to me during those years, especially in helping children receive a small gift to brighten their Christmas! I love making the stockings for them. When we complete the stockings, they are filled with coloring books, crayons, PJs, and slippers or socks, along with a small stitched bear. The totes for seniors are filled with toiletry samples, decks of cards, checkers, pajamas, and slippers. We do everything with donations from others who are committed to the mission. Sometimes we make fancier items to sell in local craft fairs or boutiques if we are able to be sponsored without any fees. That enables us to use all the proceeds from those events to purchase items for the totes or stockings we cannot get donations for. When our stockings and totes are all complete and filled, Jefferson County Human Services comes to pick them all up from us the last week of November. They distribute them where needed. We have been blessed to know they do make a difference in the lives of others! We always need more volunteers to stitch with us, or if you want to help in other ways — some of our volunteers just cut out pieces for others to sew. We can always use cotton fabrics, fleece, trims and notions to help us make stockings and bags — your leftovers from projects are great! If you have an “in” for a craft fair where the fees can be waived (or we can be sponsored) to help us sell items to earn funds for purchasing supplies, let me know. Come get acquainted with us! We are sure we can help you find ways for you to help us bless children and seniors.